For most North Indians, one form of dal (lentils) or other is not just comforting, it is a daily grind. 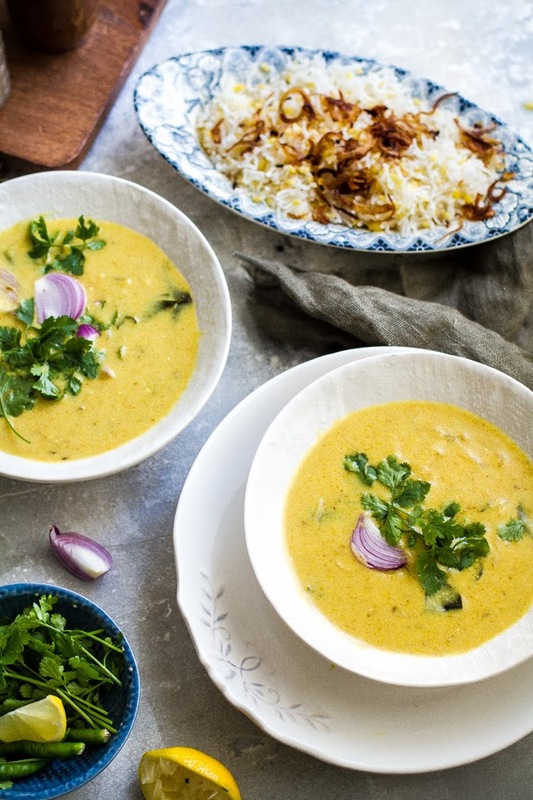 Followed closely by Kadhi, a chickpeas flour and yogurt soup often served with a lentil and rice pilaf called khichri. It is best eaten sitting on the floor, touching the earth, feasting on what came from it and into our souls made of earth. Spoons are acceptable but real comfort comes with mixing the soup and rice with your bare hands and poaching in some spicy lemon pickle or just fresh green chillies with each bite, alternated with crispy papad. It is an alchemy of flavours in their simplest, most unglamorous form. 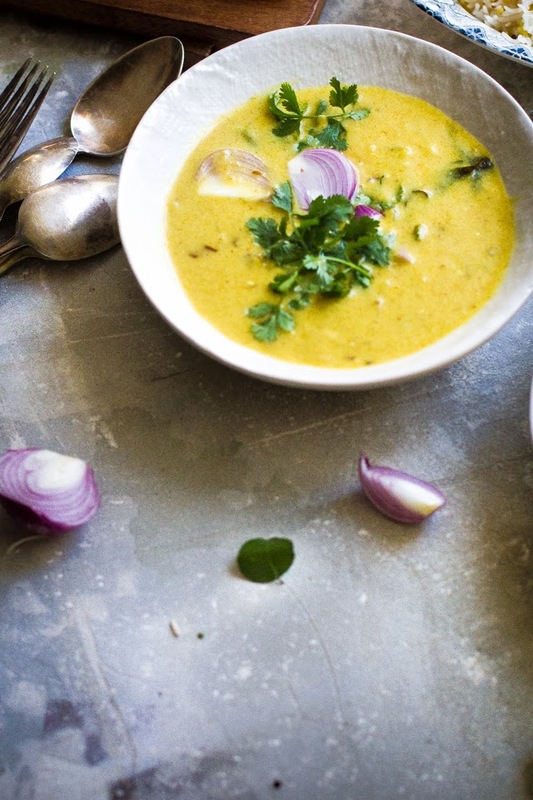 Kadhi varies regionally with thickness of the soup to addition or omission of certain spices but is mostly if not always made with a base of chickpeas flour called besan and sour yogurt. The infamous, spicy deep fried vegetable fritters - pakodas are often dipped into the soup and extras served on side but in my house that's a luxury we reserve for special days and when a heavier meal is craved. It is also served with roti or any soft flatbread for that matter. A thinner version is also good as a soup served on it's own. * Since yogurt is not as sour as the Indian sour curds, I add 1-2 tsp lemon juice towards the end. This is optional. Heat oil in a deep, heavy bottom saucepan and add fenugreek seeds and curry leaves to it. As it starts to sizzle add the onions. Once the onions are translucent add the garlic paste and green chilies. Add the turmeric, red chilly, coriander and cumin powder. Once the spices cook out a bit, add the flour mix and yogurt mix. Whisk well. Let the mixture come to a boil and add the water. Let this cook for 15-20 minutes and then cook until your desired thickness is achieved. Add more or less water accordingly. It will also thicken as it sits. Yogurt soup?! WOO HOO! This looks great! 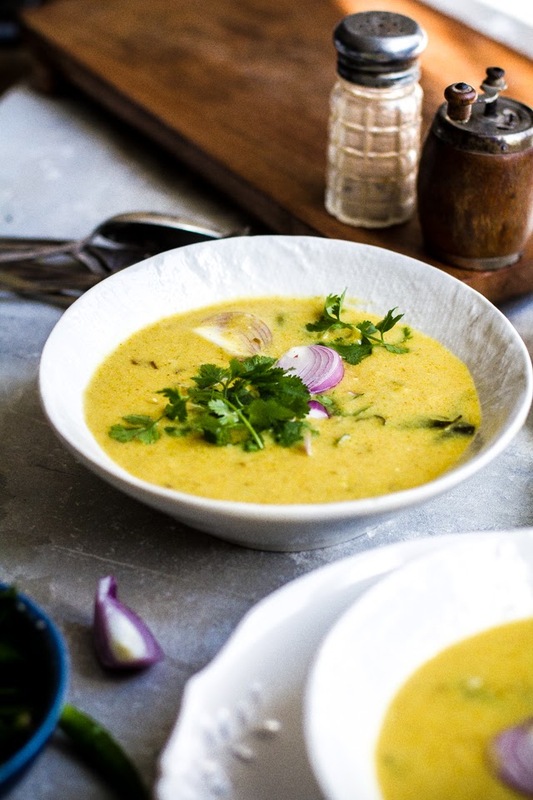 Kulsum - I just made this for lunch and it was fabulous. I had come across Persian yoghurt soups before but not this variety. I loved how velvety the soup was and served with some wholemeal flatbreads on the side it was a wonderful wonderful lunch. I will send the recipe to my mum as well - this is just the kind of dish she would adore. Absolutely love the photos in this post as well - you are so incredibly talented! Thank you and thank you for trying Sophia. I'm so glad you enjoyed it and hope your mom does too. I am craving kadi for a long time. It was never made at home, I never had it as a kid. I started appreciating its taste only very recently. I never made it, so taking my time to overcome the inhibition. Beautiful pictures as always. I liked the 'alchemy of flavors' concept, so true. Cute pepper grinder (if it's not something else). Beautiful pictures as always. 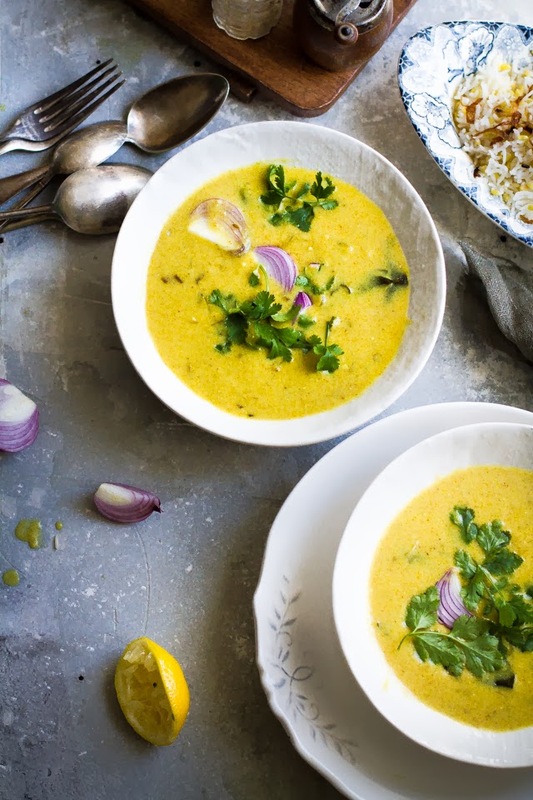 I am not very fond of kadhi while all my friends absolutely adore it. Hence hopped onto your post to see whether your recipe is a bit different from theirs. I really want to try this. 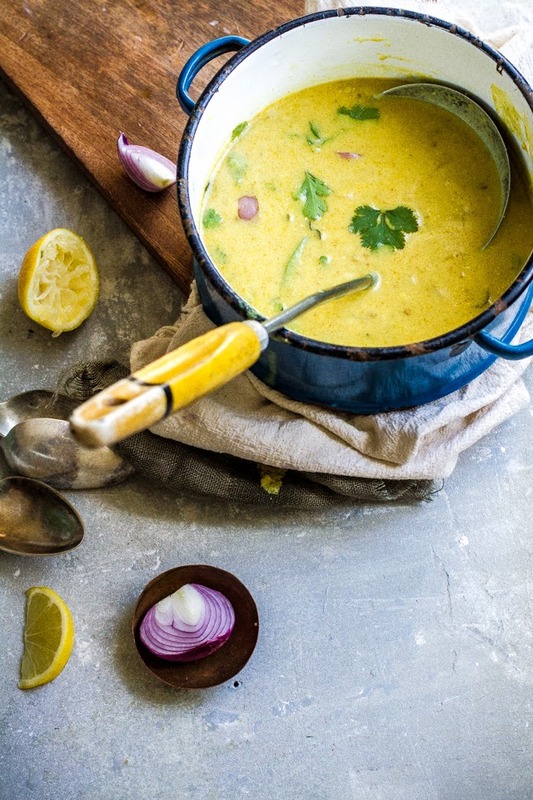 I want to change my opinion on Hallem and Kadhi! No way! We can't be friends now! 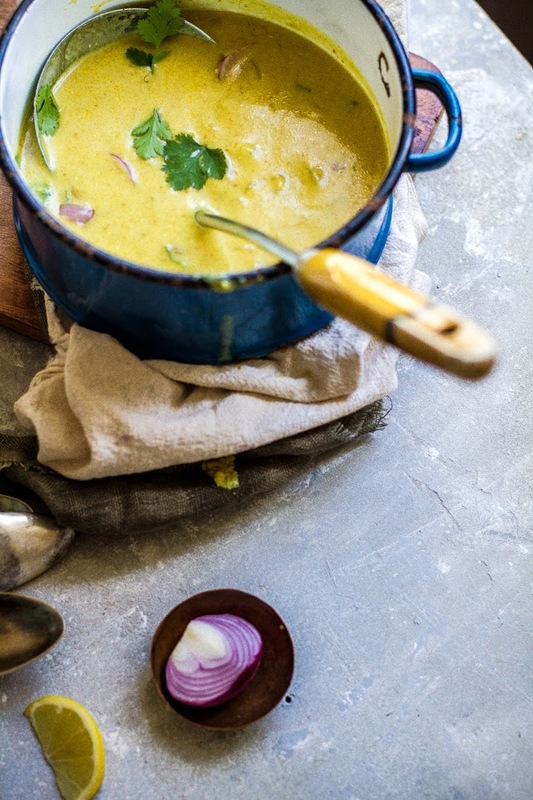 Just kidding but really kadhi is easier to like I think. This looks so delicious and perfect for winter. Thank you much. Must admit it is good anytime of the year. In summers, the yogurt is supposed to calm the body's heat. I had no idea kadhi was North Indian! I always associated it with the Gujaratis because we ate it in my grandma's house, only for ladies lunches though because the men balked at anything without meat. Loved this post, so many great memories in khadi! Looking forward to your post Kiran. This soup sounds amazing! I had never heard of using chickpea flour quite like this before, Must try! I simply love your stunning photos Kulsum! Esp the dainty bowls and the background..this reminds me of turkish yogurt soup ( yayla corbasi) which we have often at home, and my personal favourite. I must try this soup real soon, they look delish. I made this soup last week and I really liked it! So did my BF, I got a "delicous" rating :) Great flavors and texture, and a beautiful color.